1. Globally-focused Coursework. Students will complete a minimum of 8 courses that have been identified by the school district as having a strong global focus. These courses are selected by individual school districts and can be drawn from a broad of number of disciplines (i.e. Art, CTE, Business, Music, Communication Arts, Sciences, Social Studies, and World Languages etc.). 2. Globally-focused Service Learning. Students will engage in at least one sustained, globally-focused service learning activity, program or project that has been approved by the school district. 3. Global Collaboration or Dialogue. Students will collaborate with global peers through virtual or in person dialogue or collaborative projects. 4. 4 Performance-based Capstone Assessment Task. 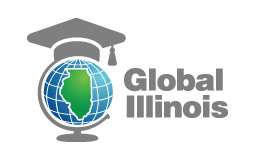 Students will complete the Illinois Global Scholar Performance-based Assessment which asks requires students to investigate and takes action to improve a global concern. 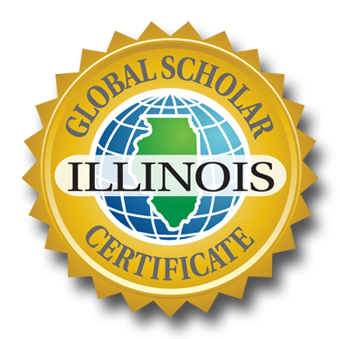 The development of Illinois Global Scholar is supported financially by a generous grant provided by The Longview Foundation, the European Union Center at the University of Illinois, the US Department of State, and Farmers Insurance. In kind support has also been pledged by a broad coalition of educational institutions including the North Central College, DuPage Foundation, the Center for Global Studies at the University of Illinois, The Chicago Council on Global Affairs, The Center for Southeast Asian Studies at Northern Illinois University, The Center for Middle Eastern Studies at the University of Chicago, Asia Society, and the Center for East Asian and Pacific Studies at the University of Illinois.